"trump will never be president"
Nothing but constant negative coverage by the fake news media and he is still at 50% approval, LOL. 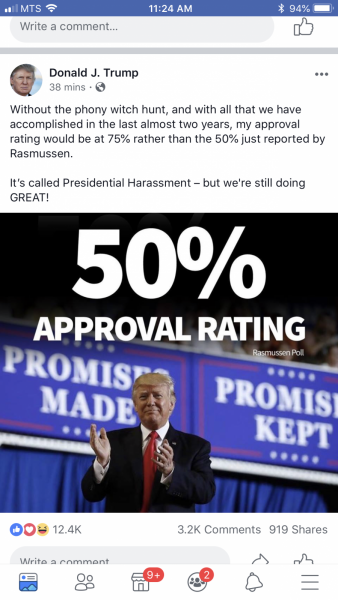 Rasmussen polls......they called all republicans and got 50%.......pitiful. all other polls have him in the 30’s. Of course Trumpie like the 50. They had Clinton winning by two percentage points. What a tool you are. Rasmussen doesn’t poll line that. Clinton won the popular vote by a wide margin. Most realize the fake news media is partisan garbage. There are still some sheep though. So you say they didn’t nail it but you have no idea what they actually polled? Neat. Huh? I didn’t make the claim you did. They certainly did not. Nail it. Wrong. What happened is not what their polls showed outside of PA. Yes everyone who disagrees with you is butthurt. You’re opinion of yourself is a little too high me thinks. Btw polls aren’t predictions. They are a snapshot in time nothing more. You don’t even know what s poll is if you think they nailed it. Does the popular vote win you the presidency? Y or n?